Developing drought resistant cereal crops continues to be a major challenge in the climate change scenario. Sorghum is a C4 crop and its yield levels are highly affected by terminal drought stress under rainfed conditions. Efficient screening methods coupled with high throughput phenotyping techniques are required for breeding climate resilient crops. Plant adaptation to drought stress is manifested by several modifications at morphological, anatomical, physiological levels. Several mechanisms including osmotic adjustments, stay green, leaf rolling, waxyness on stem, root morphology and its architecture, transpiration efficiency, secretion of soluble solutes are known to play important role in bringing drought tolerance. Several breeding methods have been proposed and a single method may not hold good for all the crop species. Recombination, mutation and molecular breeding methods are mainly used for breeding drought resistant plants. At molecular level, several QTL’s governing pre- and post flowering drought tolerance have been identified in cereals and specifically in sorghum. At genome level, genes involved in proline metabolism, transmembrane ion transporter, abscisic acid metabolism, etc., are known to be upregulated under water deficit conditions. Recent studies on transcriptome analysis showed that genes which are expressed in sensitive plants are related to stress responses and oxy reduction reactions. Recently high throughput phenotyping tools have been developed to associate drought responsive traits to genomic regions governing quantitative traits. 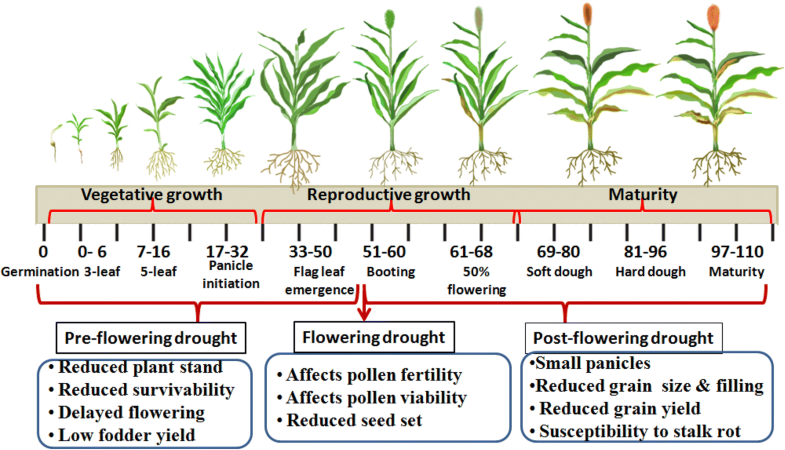 In this review, detailed mechanisms and breeding approaches related to drought stress in cereals and specifically in sorghum are discussed. Climate change is a widespread phenomenon threatening agricultural production and productivity of different food crops around the world. The Intergovernmental Panel on Climate Change predicted that global surface temperature will increase by 2 °C between 2046 and 2065 and up to 3.7 °C by 2100 (IPCC 2012). This in turn will lead to increased CO2 concentration, widespread melting of snow and rising average sea level. This scenario is more evident in northern latitudes and land regions, which have witnessed warmer climates than oceans. The extreme effect is likely to increase frequency of abiotic (heat and drought) and biotic (pest and disease) stresses. Climate change in terms of increased temperature, reduced rainfall and its erratic distribution would affect a number of yield contributing parameters, changing behavior of pollinators and disturbing biodiversity of flora and fauna. This would in turn reflect in short term crop failures and decline in the long term food production, leading to overall negative impact on the global food security. Development of stress-tolerant plant is essential for tackling the challenges of food security and climate change, particularly in arid/semiarid regions that are vulnerable to environmental calamities. Breeding for hardy, input use-efficient cereal varieties that are drought tolerant with moderately better yields with fewer inputs constitute part of the solution to the envisaged abiotic stresses arising from climate change. Studies have shown that growth and productivity of almost all the staple cereals are negatively affected by increase in mean daily (i.e., high daytime or night time) temperatures and frequent droughts. Therefore, developing drought/heat-stress-tolerant cereals continues to be a major challenge for crop breeding programs. Among the breeding strategies planned under moisture stress are enhancing tolerance to environmental stresses without any penalty on yield by exploiting wide genetic variation present in the landraces and historical cultivars and introgression of novel drought responsive genes from primary/secondary gene pool species. Drought responsive traits having positive impact on yield for one drought stress pattern may not hold good for other patterns. Therefore, breeding programs need to be planned based on location, soil types and climatic conditions. Many crop models have been proposed to study the drought stress by integrating physiological and environmental data to derive stress specific covariates (temperature, moisture stress, vapor pressure deficit etc.). On the contrary, all the environments can be grouped and one can estimate genetic correlation between each of these environments (Heslot et al. 2014). Precise dissection of location specific stress traits could be used to design tailor made breeding programs, especially by estimating G × E interaction for complex quantitative traits. In addition, analysis based on biochemical and physiological responses to abiotic stresses will help in better understanding of the individual genetic factors and the genes involved in the regulation, leading to wide ranging implications on future agriculture (Nakashima et al. 2014). Cereal crops such as rice, wheat, maize, barley, sorghum and pearl millet are the major source of food for millions of population globally. More than 50% of the caloric intake is derived from cereal grains consumption. Among the cereals, sorghum is widely grown in the arid and semiarid tropics covering an area of 44 million ha with production estimates of 62.5 million tonnes and productivity of 1.6 tons/ha globally. Among the sorghum producing countries, the United States, India, Mexico, Nigeria, Sudan, Ethiopia and Australia are the major contributors representing 77% of the world production and 70% of the sorghum area (Rakshit et al. 2014). African and Asian countries together contribute around 83% of the sorghum area and 57% of the production. There has been a drastic decline in the area under grain sorghum due to various biotic (grain mold, shoot fly and stem borer) and abiotic stresses (drought, cold and osmotic). In addition, low support prices and less profitability of sorghum as compared to other commercial food and oilseed crops in the Asian countries lead to major shift in the sorghum area. Cultivation of genetically modified corn and cotton hybrids with high productivity has gradually replaced the sorghum area in the USA (Smith 2000). African countries have experienced steady increase in the sorghum area since last decade. Recently, Asian countries have witnessed drastic reduction in the consumption of sorghum in due to the changing food habits, urbanization and improvement in the economic conditions of the people (House et al. 2000). In spite of the decline in the area and consumption, most of the sorghum growing countries have witnessed steady increase in sorghum yields (1.1–1.4 tons/ha) (Murty et al. 2007). This yield gain is mainly attributed to genetic improvement programs and crop management practices (nutrient and water management). Mainly, projects undertaken to exploit heterosis through hybrid development has led to better yield gain in the developed countries. While, cultivation of historical varieties and landraces have led to slow yield gain in African countries and Indian states (Cothren et al. 2000). Sorghum bicolor, the primary species in cultivation has the ability to produce yields under adverse conditions. It is a buffer crop for the marginal farmers providing grain and fodder under minimal inputs. Sorghum uses C4 photosynthesis mechanism resulting from the complex biochemical and physiological specializations that improves carbon assimilations (50 g/m2/day) at high temperatures (Prasad et al. 2008). Based on the inflorescence pattern, the cultivated sorghum genus was classified into five races (bicolor, caudatum, durra, guinea and kafir) and 15 intermediates (House 1985). Most of the varieties grown in the post-rainy season in southern and central India are of durra type and are mainly used for food purpose, while kafir race is predominantly grown in the USA. The caudatum race has been extensively used for hybrid and varietal development. In order to diversify, durra and guinea races need to be exploited in recombination breeding programs for enhancing yield levels under terminal drought stress conditions with tolerance to charcoal rot disease (Aruna and Audilakshmi 2008). In the Sudan, Sahelian zone of West Africa, Guinea race dominates with its varying maturity groups. This race has generally high degree of photoperiod sensitivity (Grenier et al. 2001) which enables the phenotypic plasticity of the crop cycle to better match the season length (Haussmann et al. 1998). Among the cereal crops, moisture stress during reproductive phase can reduce seed set from 35 to 75% in rice, wheat and sorghum (Sheoran and Saini 1996). Sorghum requires less moisture for growth compared to other major cereal crops; for example, sorghum required 332 kg of water per kg of accumulated dry matter whereas maize, barley and wheat required 368 kg, 434 kg and 514 kg of water respectively (Reddy et al. 2011). Although sorghum has wide adaption to abiotic stresses but the response would vary depending on whether the onset of stress is pre or post flowering and shallow or deep soil type (Kebede et al. 2001). Deep vertisols support better plant stand under moisture stress conditions than shallow soils. In order to develop climate resilient plants with improved water use efficiency, there is need to study the agronomical, physiological, biochemical and molecular basis of drought tolerance by integrating crop modeling and genomic prediction tools (Tardieu et al. 2018). In addition, the combination of phenotyping and selection of traits under moisture stress conditions is important as it involve complex interaction within the plant and with environment. In this way, the real assessment of the drought stress and its effect on crop plants can be studied by generating genetic variability for morphological, physiological and yield contributing traits, formulating efficient screening techniques at laboratory and field level and precise phenotyping methods to screen genotypes/mutants in a controlled condition. In this context, the present review discuss mechanisms pertaining to drought stress, plant response to various phases of moisture stress and genetic and molecular breeding methods to combat these problems. Plant species have developed their own adaptation mechanisms to withstand extreme climatic conditions (Fig. 1). These adaption mechanisms in response to drought resistance can be classified as drought escape, drought avoidance and drought tolerance (Ludlow 1989). These mechanisms might have evolved independently or as a heritable response dependent on environment. Plant responds to drought stress by escape mechanism by adjusting its crop cycle before the onset of severe moisture stress. Depending on the availability of moisture levels in the soil regime, reproductive growth is completed with small sized panicle. This is also accompanied by remobilization of leaf nitrogen maintain adequate carbohydrate. The ratio of carbon, nitrogen and abscisic acid (ABA) levels affect senescence. Stay green, a trait that maintain green canpoy even at maturity, ensures balance between nitrogen demandby grain and the one captured by vegetative parts. Drought avoidance is the ability of plants to maintain normal physiological processes under moisture stress conditions by maintaining high water potential. Plants may reduce water loss by rapid stomatal closure, leaf rolling, increased wax accumulation on leaf and stem surface in rice, sorghum and maize and enhancing water uptake by profuse root system. Drought tolerance is the ability of plant to sustain physiological activities under moisture stress conditions. It can withstand stress conditions through osmotic adjustment and production of proteins, such as proline. Plants invariably avoid drought by reducing stomatal conductance to save water and this may lead to reduced rate of CO2 fixation and growth. Improving osmotic adjustments, increasing cell wall elasticity to maintain tissue turgidity and altering metabolic pathways are the physiological mechanisms adapted by plants under severe drought stress conditions (Mitra 2001). Drought escape and avoidance mechanisms are usually related to moisture levels, water uptake and water use efficiency of the plants. This is highly influenced by the location, climatic conditions and soil types. In order to characterize plants for drought escape or avoidance mechanisms, there is a need to study the differential response of genotypes under different locations/seasons by screening them in multi-location trials. Plants are highly vulnerable to drought and heat stresses at reproductive stage. Although the transition from vegetative to reproductive path is influenced by photoperiod and vernalization mechanisms, but avoidance of drought stress by early flowering may limit yield potential, as the crop duration is limited. In case of terminal drought stress, the yield potential is affected by moisture stress and result in the reduced panicle length, grain number and seed weight. The severity of the moisture stress affects pollen viability and developing florets abort prematurely during inflorescence development leading to reduced grain yield. Sorghum is mainly grown in post rainy season under the residual soil moisture conditions in Asian countries. In post-rainy season severe terminal drought stress may lead to poor fodder quality, which is not suitable as livestock feed due to fungal infection. In water receding conditions, sorghum planted (starting February) in lakes are harvested in September–October, while vegetative parts are used for feeding livestock in West Africa In order to maintain green stems and upper leaves under water stress during grain filling stage, stay-green or non-senescence trait is highly beneficial (Rosenow and Clark 1981). Sorghum genotypes with the stay-green trait continue to fill their grains normally even under limited moisture stress conditions. Delaying the onset of leaf senescence is an effective strategy for increasing grain and fodder production particularly under water limited conditions (Borrell et al. 2014). 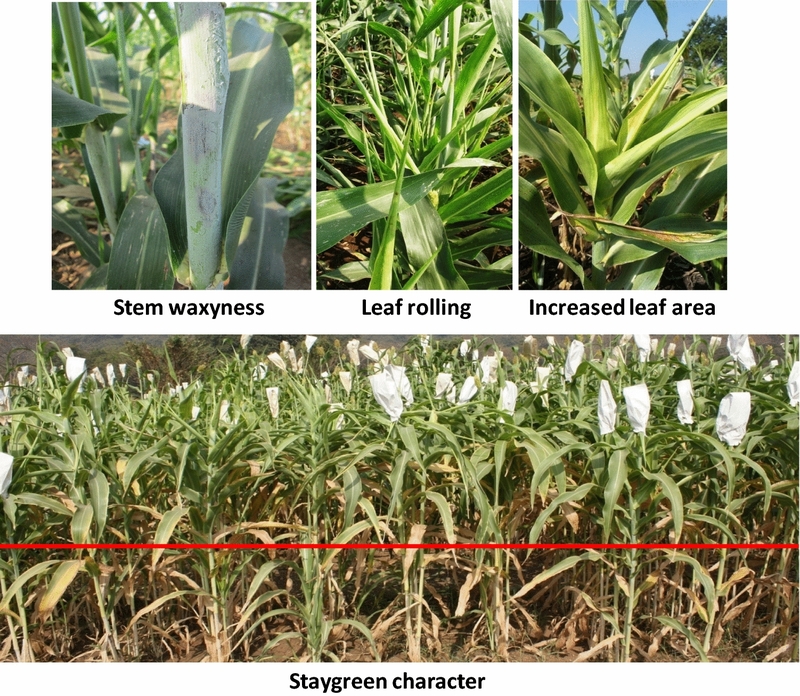 Staygreen is an adaptive mechanism found in sorghum, and is characterized by delayed onset of senescence (type A), reduced rate of senescence (type B), reduced photosynthesis although chlorophyll is retained (type C) and retainment of greenness at maturity (type D) and maintenance of green canopy since beginning (type E) (Thomas and Howarth 2000). Stay green at pre-anthesis and fertilization will help in enhancing grain numbers per panicle ultimately contributing to grain yield. It will also efficiently remobilize assimilates during grain filling stage, otherwise, it may affect grain weight, quality and nutrient efficiency (Jagadish et al. 2015). In general, cereal crops store excess carbohydrates within the vegetative tissues and non-structural carbohydrates in the parenchyma cells of stem. Staygreen phenotype is manifested by low sink demand in a plant (translocation of nutrients from leaves to grain). This could lead to small panicles or less number of grains per panicle. The possible way to enhance sink strength under moisture stress is through readjustment od non-structural carbohydrate from stem and support yield stability. In this context, breeders need to select plants with high grain yield and staygreen phenotype at maturity, ensuring delayed leaf senescence under high sink demand. According to Borrell et al. (2000), staygreen in sorghum is a combined effect of total green leaf area at flowering, onset of senescence and subsequent rate of senescence. It also indirectly contributes to disease resistance and reduced lodging, especially by the Macrophomina fungi, causing charcoal rot disease (Woodfin et al. 1988). Several studies in cereal crops have demonstrated the utility of using the staygreen phenotype as criteria to declare drought tolerant crop. In addition, stg’ loci have also been introgressed in recombinant inbred and near isogenic lines to correlate genomic regions linked to drought responsive traits (Harris et al. 2007). Plant drought stress response and resistance mechanisms are the complex processes that need to be studied using physiological, biochemical and molecular approaches. Over the years, plants have evolved several acclimation and adaptive mechanisms in response to short/long term drought stress. State of moisture stress is perceived by the plant with excessive evapo-transpiration from soil, plant and atmosphere of the hydrological cycle (Blum 2011). Plants that maintain basic metabolic processes even at low water availability and they can be classified as drought tolerant genotypes. In most of the field crops including sorghum, drought can occur at pre-flowering and grain filling stages of the plant development (Kebede et al. 2001) (Fig. 2). At seedling stage, severe drought stress would affect plant stand and survivability. At grain filling stage, moisture stress affect pollen fertility, peduncle length, panicle exertion, yield components (Ji et al. 2005). Typically it causes premature leaf senescence and stalk lodging leading to reduced grain filling and succumbing to stalk rot diseases. The impact of stress varies from genotype to genotype. This variation could be due to morphological and physiological modifications (Borrell et al. 2006). In the first instance, under moisture stress conditions, most tolerant plants would show low stomatal conductance with increased leaf temperature, leaf rolling and are controlled by soil moisture dependent root signals and leaf water potential respectively (Dingkuhn et al. 1999). While, stomatal closure reduce leaf area and reduced assimilate translocation can result in the poor grain formation. Thus, stomatal response to moisture stress is very important factor and highly dependent on soil –water content. Root is an important part of plant in acquisition of nutrients, conduct of water, synthesis of hormones and organic acids and providing mechanical strength to the plant. Root are the initial plant parts in sensing the drought stress and regulates water acquisition by penetrating deep into soil regime under stress conditions. Small fine, long specific roots and root density have considerable influence on the water absorption from deep soil profiles. Small xylem vessels in targeted seminal roots can save soil water deep in the profile and help in their use during grain filling stage. In sorghum, large number of seminal roots, large vessel diameter in seminal and nodal roots are highly correlated with drought tolerance. Genotypes possessing deep root system, more root density and wide root distribution were highly correlated to moisture stress tolerance (Taiz and Zeiger 2006). Nour et al. (1978) reported that root weight was the best and easiest attribute to determine drought tolerance in grain sorghum. Matsuura et al. (1996) on the other hand reported a positive correlation between drought tolerance and root length in sorghum. Even the greater root activity under intermittent drought can also enhance crop stability by reducing the incidence of water deficits (Ludlow and Muchow 1990). Hydraulic conductance is basically dependent on number of functional nodal roots in sorghum and highly affected by supply of phosphorus under moisture stress (Blum et al. 1977). Plant adaptations to survive under drought stress may be anatomical, morphological or physiological in nature and in turn they help in maintaining the favorable water balance (increasing water absorption or decreasing water loss) or allowing desiccation tolerance at low leaf water potential. Osmotic adjustment plays a major role in drought stress in plants (Hsiao et al. 1984; Izanloo et al. 2008). Sorghum landraces that are collected from arid/semi arid environment showed greater osmotic adjustment than the landraces from humid environment. It is believed that under drier environments, landraces were dwarf with high rates of transpiration and low rates of leaf senescence (Blum and Sullivan 1986). Osmotic adjustment helps to increase crop yield due to delaying of leaf rolling and leaf tissue death (Blum 2011). The effective leaf area for photosynthesis increases when leaf rolling and leaf senescence decreases. Ludlow and Muchow (1990) reported that sorghum genotypes with high osmotic adjustment registered 24% higher yield than genotypes with low adjustment, when drought stress occurred during grain filling stage. Amede and Schubert (2003) also revealed that around 20% increase in dry matter in legume species that maintained turgor through osmotic adjustment. Under the prolonged drought stress condition, further reduction in the osmotic adjustment lead to poor seed formation (Hsiao et al. 1984). The plant’s exceeding energy requirements for osmotic adjustment could be due to high energy cost in synthesizing solutes in stressed plants compared to non-stressed plants (Blum 2005; Mitra 2001). Transpiration efficiency (TE), amount of biomass accumulation per unit water transpired is a useful trait in selecting genotypes under drought stress (Xin et al. 2008). Variation in TE within species has been demonstrated for several C3 and C4 plant species. Sorghum is well adapted to moisture stress conditions and performs better than other C4 crops (Impa et al. 2005; Amaducci et al. 2016). Genotypes with low internal CO2 concentration and enhanced photosynthetic capacity may be associated with high TE, whereas high TE is strongly correlated with increased biomass accumulation. Being rainfed crop, enhancing TE could be the best strategy to achieve higher yield gains in sorghum (Xin et al. 2008). Several studies have reported wide TE values in sorghum (3.21–7.55 kg/m3) at physiological maturity, validating its wide adaptability under extreme stress conditions. (Balota et al. 2008; Xin et al. 2009; Vadez et al. 2011). Plants grown in arid/semi arid regions are often exposed to intermittent/long dry spells. Short term drought stress will affect the growth stages temporarily and later will recover back due to their high water use efficiency. In the long term dry spell, stomatal conductance is highly influenced by leaf anatomical traits, such as stomatal density, number and size (Xu and Zhou 2008). Changes in the leaf anatomy are known to alter CO2 diffusion from substomatal cavities to the carboxylation site and thus maintain photosynthetic rate despite low stomatal conductance (Chartzoulakis et al. 1999). Even the increase in stomatal density and number of mesophyll cells were also evident in controlling water loss. The complex of heat and drought stress could induce short crop cycle and increase in vapour pressure deficit (VPD) respectively. Although genotypes may respond differentially to both these stresses, but it is important to identify traits associated with both stresses (Pinto and Reynolds 2015). Solutes are low-molecular-weight and highly soluble compounds that are usually nontoxic even at high cytosolic concentrations. Generally, they protect plants from stress through different means such as osmotic adjustment, detoxification of reactive oxygen species, stabilization of membranes and native structures of enzymes and proteins (Farooq et al. 2009). Plant species would also synthesize sugars, organic acids, polyols, polyamines, amino acids and get accumulated in the cytoplasm leading to reduced osmotic potential and thus maintain turgor of both shoots and roots (Chen and Murata 2002). Being small organic molecules of low molecular weight, these compatible solutes have the tendency to accumulate at high levels without interfering in the normal intra and intercellular homeostasis (Roychoudhury et al. 2008). Specifically in sorghum, glycine betaine and proline are secreted in response to water stress (Buchanan et al. 2005). Glycinebetaine is synthesized by oxidation of choline (choline monooxygenase) by converting choline into betaine aldehyde and later betaine aldehyde dehydrogenase (BADH; a NAD + dependent enzyme) produces glycinebetaine. Exogenous treatment of BADH has been reported as a potential and traditional approach for crop tolerance against multiple abiotic stresses. Developing new varieties with tolerance to drought is paramount interest in a climate change scenario. Although knowledge and techniques obtained upstream may be used in the breeding program for drought tolerance, only a few of the cost-effective techniques could be adopted. Breeding for drought tolerant crops need to consider the drought stress season, duration and severity; growth stages of the crop facing the drought stress and types of genotype (conventional pure lines or hybrids). Sorghum breeding generally include (a) breeding by selection; (b) recombination breeding, (c) hybrid breeding (heterosis utilization), (d) induced mutations and (e) molecular breeding. Under moisture stress conditions, especially in rainy and post-rainy days, breeding would mainly depend on residual soil moisture, type of soil and its depth. Genotypes with early flowering and maturity (90–100 days) would be highly preferred in shallow soils. Leaf area, panicle weight, gain number and percent of grain setting may decide productivity in genotypes adapted to shallow soils. While, in medium to deep black soils (clay/vertisols), high water holding capacity would translate into more per day grain and fodder productivity. Increased harvest index, greater panicle exertion, high relative water content and slow leaf senescence (functional staygreen) are the main features of the genotypes adapted to deep soils. Accordingly, different breeding methods are applied to exploit genetic variability present in the local landraces/germplasm lines/genotypes under moisture stress conditions. In the previous studies involving five sorghum genotypes from Sudan were evaluated for drought stress by withholding irrigation for 3-weeks. Tolerant plants showed reduced panicle length and weight, less number of grains per panicle and low seed weight. Taggat-10 genotype was better yielding with improved water use efficiency (Jabereldar et al. 2017). The drought stress had also induced sharp increase in the prussic acid, leaf area index, dry matter and plant height when field moisture content was ranging from 20 to 80% (Moaveni 2010). Drought stress under well watered and drought stress conditions during grain filling stage could affect flowering and grain yield by 35% (Rakshit et al. 2016). Susceptible lines showed loss of green leaf area and resistant genotypes (IS 23514 and Phule chitra) were stable and retained green leaf area. Root associated bacteria have direct role in combating negative effects of drought stress on plant growth (Xu et al. 2018). Based on the meta-transcriptome sequencing and root matabolomics, studies have demonstrated the abundance and increased activity of monoderm bacteria. The isolates have also proved their increased colonization impacting positively on plant growth. In a study involving 19 sorghum genotypes were evaluated under drought stress and showed that there existed differential yield response under stress conditions (Hamza et al. 2016). There was high grain yield and significant positive correlation between yield and other contributing traits. The genetic diversity was also established using ISSR markers among these genotypes. Mutation breeding is an effective technique to induce genetic variability for drought responsive traits in crop plants. The use of induced mutations has contributed in the development of improved plant varieties in cereal and other food crops (Hanna 1982). A large number of improved mutant varieties have been released for commercial cultivation in different crop species demonstrating economic value of the mutation breeding technology (IAEA 1984). Radiations have been most frequently used (X-rays, gamma rays, electron beams and ion beams) for the genetic improvement of cultivars, while ethyl methane sulphonate (EMS) and sodium azide (SA) are the potential chemical mutagens. New alleles or combination of alleles encoding traits of economic importance can be generated by induced mutagenesis enabling modification of one or two traits in a well adapted variety. Very few reports are available on the use of induced mutagenesis for drought tolerance in sorghum. Recently, three drought tolerant mutant varieties of sorghum, PAHAT, SAMURAI 1 and SAMURAI 2, were released for farmer’s cultivation in Indonesia (Sihono 2010; Human et al. 2006). These mutant varieties were grain types possessing semi-dwarf stature, early maturing, high yielding and recommended for dry season cultivation especially in drought prone areas of the eastern part of Indonesia. In addition, gamma ray induced (300–500 Gy) mutant lines were developed by direct field screening for drought tolerance. These mutant lines viz., B-68, B-72, B-95 and B-100 were high yielding under drought stress with grain yield of 4.55, 4.50, 4.20 and 4.62 t/ha, respectively (Human et al. 2011). Although frequency of favorable mutations are very low, but screening large mutant population in the rainfed conditions over multiple seasons may lead to improved drought tolerant mutant. Molecular breeding is the application of molecular biology tools in plant breeding, which includes molecular marker assisted breeding and breeding by genetic modification (genetic engineering). Drought tolerance is one of the most difficult trait to study and manipulate genetically as it is controlled by many genes. The direct selections for drought tolerant traits using conventional approaches have been slow and difficult to achieve due to their quantitative inheritance and unpredictable expression across different drought regimes. 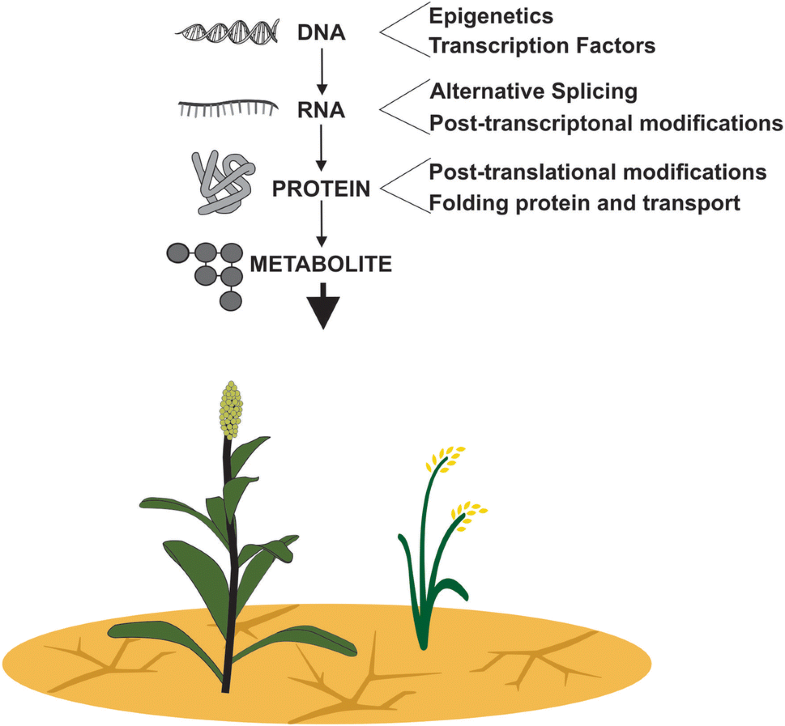 Development of molecular markers associated with drought tolerant traits based on QTL analysis provides great opportunity to improve understanding of the genetic inheritance of such complicated traits (Ejeta et al. 2000). Many QTL's associated with pre- and post-flowering drought tolerance have been identified in sorghum (Tuinstra et al. 1998; Crasta et al. 1999; Subudhi et al. 2000; Tao et al. 2000; Xu et al. 2000; Ejeta et al. 2000; Kebede et al. 2001). Four QTLs influencing stay green trait, an important post flowering drought resistance have been identified (Stg-1, -2, -3, -4) (Tao et al. 2000; Xu et al. 2000; Haussmann et al. 2002; Subudhi et al. 2000). Stg-2 QTL region is the most significant, which could be used to either marker-assisted introgression into elite agronomic background or map based cloning to genetically engineer this locus in an improved cultivar. Some of the QTL’s affecting nodal root angle were also co-located with drought response in sorghum (Mace et al. 2012). As many as six genomic regions with pre-flowering drought tolerance and eight regions for yield contributing traits under fully irrigated conditions have been identified in sorghum (Tuinstra et al. 1997). Most of these studies have identified multiple QTL’s, each having major effects to the stress responsive phenotypes. This could be due to lack of precise screening methods and complexity of the genetic mechanisms underlying the drought stress. Using high throughput phenotyping techniques and precise multi-location data can provide better association between quantitative traits and genomic regions governing them. Drought is one of the major limitations affecting food production especially in semi-arid/arid regions. There is a growing demand to produce crops that can survive under extreme environmental conditions such as drought and heat to maximize crop production (Tester and Langridge 2010). The severity of drought is unpredictable as it relies on several factors like occurrence of rainfall and its distribution, evaporation rate and moisture retaining capacity of the soil. Soil water deficit conditions can dictate the yield levels via three mechanisms, viz., reduction in canopy absorption of photosynthetically active radiation (PAR), reduced radiation use efficiency (RUE) and low harvest index (HI). Effects of soil water deficit can even be seen in the roots, shoots and leaves of plants at morphological, physiological and biochemical levels. Several techniques/methods have been designed to estimate/measure drought responsive traits at morphological/canopy level and underground for root traits (Table 1a, b). Amongst widely cultivated cereal crops, sorghum has C4 biochemistry that allows it to maintain photosynthesis even at low CO2 concentrations, i.e., when stomata are significantly closed and avoids photorespiration compared to C3 plant. However, this alone does not explain its drought tolerance in comparison to maize, which has similar C4 metabolism but possesses much lower drought tolerance. Sorghum has four growth stages, which are recognized as most vulnerable to moisture stresses; (1) germination and seedling emergence; (2) early seedling stage (from seedling emergence to panicle initiation); (3) mid-season (from panicle differentiation to flowering) and (4) post-flowering to grain filling stage (Reddy et al. 2011) (Fig. 2). The responses of sorghum to moisture stress at these four growth stages have been well characterized with heritable genetic variation underlining these responses (Mkhabela 1995). Several modifications at plant level were studied such as stay-green, stem and leaf waxyness, leaf rolling, root morphology and architecture (Fig. 3). They are reported as critical drought tolerance phenotypes and knowing each of these mechanism would help in better understanding of drought tolerance. Stay-green is an integrated drought-adaptation trait in cereal crops. 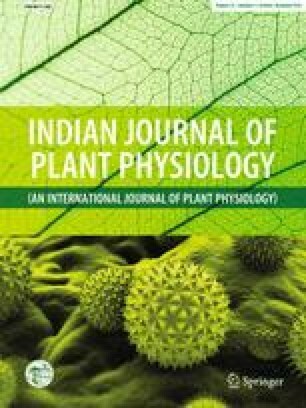 Delayed leaf senescence during grain filling stage is a consequence of dynamics occurring earlier in crop growth and is largely due to balance between the supply and demand of water, as well as the efficiency with which the crop converts water into biomass and grain yield (Tuinstra et al. 1997). On the supply side, crop water use during grain filling can be enhanced by increasing water availability at anthesis and/or increasing water accessibility during grain filling. On the demand side, crop water use can be reduced by decreasing leaf area and/or transpiration per unit leaf area. Leaf area can be constrained by reducing tillering, leaf number, and leaf size. Transpiration per unit leaf area can be in turn limited by stomatal density or aperture, timing of stomatal opening and hydraulic factors. There are multiple ways for a plant to remain green. A stay-green phenotype may arise if the onset of senescence is delayed (type A), the rate of senescence is reduced (type B), chlorophyll is retained but photosynthesis declines (type C), greenness is retained due to rapid death at harvest (type D), or the phenotype is greener to begin with (type E). This classification indicates that staygreen may be functional or cosmetic (Cha et al. 2002). Functional stay-green is characterized by the maintenance of leaf photosynthesis during grain filling stage (types A, B, and E), while cosmetic stay-green occurs when photosynthetic capacity is disconnected from leaf greenness (types C and D). Enhanced crop productivity in water-limited environments is dependent on functional stay-green. However, not all functional stay-green is necessarily productive. The BTx 642 (B-35), SC-56 and E-36-1 have been identified as best sources for staygreen. It has type-A stay green characterized by delayed onset of leaf senescence (Thomas and Howarth 2000). Staygreen genotypes are characterized by their high levels of cytokinin and stem sugars (Duncan et al. 1981) than non senescent genotypes under moisture stress conditions. Although precise physiological basis of staygreen mechanism has not been understood, but its positive impact on yield under terminal drought conditions has been confirmed by several studies (Borrell et al. 2000; Jordan et al. 2003). Stay green QTL profiles of the best and poorest stay green lines from a recombinant inbred population has indicated presence of three loci viz., Stg1, Stg2 and Stg3. They appeared to be important for the expression of this trait when the percent phenotypic variation and the consistency in different environments are considered (Subudhi et al. 2000). A significant epistatic interaction involving Stg2 and a region on linkage group C was also identified for the stay green and chlorophyll content. Stg2 is the most robust QTL controlling stay green, explaining the maximum amount of phenotypic variation. Cultivars utilize a multiplicity of avoidance and/or tolerance mechanisms to achieve some measures of overall drought resistance in a given climate (Jordan et al. 1983). Epicuticular wax (EW), an important drought tolerance measurement has a potential value in a breeding program for enhanced drought resistance (Jordan et al. 1983; Harris 2007). Essentially all hybrid grain sorghums cultivated in the United States have a characteristic waxy bloom present on the leaf sheath, peduncle, and leaf lamina. The presence of bloom was reported to be conditioned by two genes, bloom (Brn) and bloom (H), which are completely dominant over bloomless (hm) and sparse bloom (h) (Ayyangar et al. 1937; Ayyangar and Ponnaiya 1941). Visual scoring of parents, F1s, and F2 populations suggested that multiple genes are controlling this trait (Peterson et al. 1982). Either of two gene combinations, bm1bm1 and bm2bm2, results in the bloom character which alters transpiration rate in drought stress condition. Shanchez-Diaz et al. (1972) proposed that the wax filaments reduces the net radiation by increasing reflectance and thickening the boundary layer, thereby increasing the diffusive resistance to gas exchange. The wax filaments formed were dense network on the abaxial (lower side) surface of leaves and on leaf sheaths. However, the adaxial (upper side) laminar surface is rarely covered with bloom, and most radiant energy is incident on that surface. Therefore, the role of wax filaments in altering the energy balance of the canopy may be minor. In addition to wax filaments, the normal bloom genotype also has more EW deposited on the leaf as thick, amorphous layer covered by flakes of wax (Blum 1975). The thicker EW layer of normal genotypes was associated with reduced cuticular (dark) transpiration and greater (5%) visible and near-IR reflectance. Blum (1975) proposed that the thick EW layer enhances stomatal control of water loss. This supported earlier observations that sorghum leaves dried more slowly than corn leaves after stomatal closure (Martin 1930). Several newly released sorghum varieties from Mali developed to suit drought prone area, have stem/leaf waxy layer trait. By analogy they could be designated as drought tolerant but confirmation should be made by evaluating them under drought conditions. Among the important traits involved in crop response to drought, leaf rolling has been evocative to breeder as a trait of interest in discriminating drought tolerant genotypes. Apart from yield, the most widely used selection criterion for drought resistance in sorghum breeding programs is plant appearance under stress (Blum et al. 1989). This was well demonstrated in series of experiments, where leaf rolling and premature leaf senescence (‘firing’) under drought stress are visually observed and reduced leaf rolling and firing are selected for (Rosenow et al. 1983). While reduced leaf rolling has been shown to reflect the genotypic ability for maintaining a better water status under stress in rice (O’Toole and Moya 1978), no critical assessment has been performed for leaf rolling as a selection criterion for drought resistance in sorghum. Studies in sorghum (Chaudhari et al. 1986) have indicated that infrared canopy temperature sensing could differentiate among genotypes subjected to drought stress. However, the association between canopy temperature and drought resistance may be limited to plant heading under stress as an index of resistance. Special consideration was given to leaf rolling and canopy temperature as possible indices of plant stress in the field screening. Drought resistance was defined here as a superior ability for absolute and relative plant production under drought stress, where relative grain production was estimated by the ratio of yield under stress to yield under non-stress conditions. Values from leaf rolling as a possible selection criterion for drought resistance are encouraging, though not perfectly straightforward. On the contrary, leaf rolling did not differ significantly between drought-resistant (R) and susceptible (S) genotypes, but the difference between the two in mid day leaf rolling water potential (MLWP) was significant. Leaf rolling was, however, reasonably predictive of MLWP across all genotypes when the variation in MLWP was larger. Leaf rolling trait may be useful as an indirect scale for estimating large differences among sorghum genotypes in water stress, with no priori association with final grain production. The use of reduced leaf rolling under stress in some sorghum breeding programs may be justified, but it cannot be expected to serve as a single selection criterion for plant production under drought stress (Blum et al. 1989). Yared et al. (2010) argued that sorghum is more drought tolerant than other field crops because of its waxy bloom in leaves and stem, better adjustment in leaf angle, and leaf rolling under water stress conditions. These characteristics may vary among sorghum hybrids. Thus, the variation among sorghum varieties should be well utilized as a source for developing drought tolerant hybrids rather than relying on yield differences alone. Roots are essential for plants catering various functions such as uptake of water and nutrients for plant growth, serve as storage organs, anchor the plants and are the site of interactions with pathogenic and beneficial organisms in the rhizosphere. The plasticity of root growth and development in response to changing moisture and nutrient status of the soil provide opportunities for exploring natural variation to identify beneficial root traits to enhance plant productivity in agricultural systems (Kano et al. 2011; Grossman and Rice 2012; Lynch 1995). Agronomic and physiological differences such as osmotic adjustment (Tangpremsri et al. 1991), epicuticular wax content (Blum 1989), leaf water potential, canopy temperature, leaf rolling, leaf carbon exchange rate, and stomatal conductance (Blum 1989) are some mechanisms that have been associated with drought stress (Table 1b). Correlation between root variation and osmotic adjustment among sorghum genotypes was also analyzed (Tangpremsri et al. 1991) and found that its drought tolerant nature is due to its profused root system, ability to maintain stomatal opening at lower levels of leaf water potential and high osmotic adjustment (Yared et al. 2010). Borrell et al. (2014) indicated that future focus of sorghum breeding should be on developing a hybrid that efficiently recovers available water resources from its surroundings. For this reason, understanding variations in root traits among sorghum genotypes should be well investigated in the future breeding programs. Genotypic differences in nodal root angle can affect spatial water-use patterns of mature plants. Singh et al. (2012) observed genotypic association with narrow root angle (vertical root system) possessing relatively more root length directly below the plant than wide root angle (horizontal root system), which produced more lateral roots, resulting in more lateral water uptake. Although differences in relative water extraction were not significant, these preliminary results do support the hypothesis that a narrow root angle may increase water accessibility in deep soils under higher plant density, whereas a wide root angle may increase water accessibility under lower density (e.g. skip row) management systems. These results support the inclusion of root angle as a selection criterion in sorghum breeding programs. Drought tolerance can be achieved at different levels starting from pre-flowering to post pollination. Defining moisture stress at each level has to be taken up by establishing screening procedures with environmental conditions representing the target location. There is a major tradeoff between managing representative day length, vapor pressure, temperature conditions and relative soil moisture levels. On the other hand, repeating the target environment with similar soil moisture levels and maintaining other edaphic conditions would be difficult, specifically for estimating GXE effects (Bidinger et al. 1996). Crops face different drought scenarios, consequently, the physiological traits that confer drought resistance in specific environments may vary (Monneveux et al. 2012; Ghanem et al. 2015). Therefore, managing drought screening requires careful analysis of non-genetic variations among plots, replications and repeated experiments, which should be reduced at minimum levels. Drought assessment is one of the complex procedures, as it affects several plant processes, manifesting in the significant yield loss. Under drought stress, there is drastic reduction in the photosynthesis and growth due to stomatal closure and associated changes in carbon and nitrogen metabolism. Therefore, the drought response triggered by many detectable features has to be accounted for drought screening under controlled conditions. Several effective and reliable screening techniques have been developed to identify resistant/tolerant sources from the germplasm and breeding lines (Reddy et al. 2007). They include growth stage-specific screening techniques such as screening for coleoptile and mesocotyl lengths,seedling emergence under high surface soil temperature,recovery from seedling drought,recovery from mid-season and terminal drought stress tolerance. Four ways of breeding for drought tolerance/resistance have been proposed (Reddy et al. 2007). The first is to breed for high yields under optimal conditions, i.e. to breed for yield potential and then to assume that this will provide a yield advantage under sub-optimal conditions. The second is to breed for maximum yield in the target environment. The third approach is to select in the F5 and F6 generations for yield components under optimal environment conditions and selection of duplicate samples under stress conditions (Blum 1979, 1983). The fourth breeding approach aimed to establish a single drought resistance character incorporated into existing breeding program. Physiological traits should be sought for maximum green leaf area, delayed onset of leaf senescence and reduced rate of leaf senescence to improve sorghum yield under terminal drought situation. Leaf temperature determined with thermography has great potential for high throughput screening of drought tolerance (Liu et al. 2011). These physiological traits phenotyped using high throughput techniques would help breeder’s to select for genotypes showing differential response to drought stress. Understanding the plant response to moisture stress (pre-flowering and terminal stress) is important in formulating screening procedures. Several methods, at field or in controlled environment are commonly used to screen genotypes at morphological, physiological, biochemical and molecular levels. Field studies are more reliable than in controlled environment for screening large populations under drought stress. Several drought scoring scales have been followed in sorghum and the 0–9 scale, based on leaf drying is widely used among the researchers (0—no dry leaves: not sensitive, 1—1–10% dry leaves: extremely low, 2—11–20%: very low, 3—21–30%: low, 4—31–40%: slightly low, 5—41–50%: intermediate, 6—51–60%: slightly high, 7—61—70%: high, 8—71–80%: very high, 9—81—90%: extremely high) (Sakhi et al. 2013). Some of the physiological parameters are also instrumental in drought screening, such as leaf relative water content (RWC) (the ratio of fresh weight—dry weight and turgid weight—dry weight), leaf are (leaf length x breadth), tolerance index (ratio of biomass produced under stress and control conditions), drought susceptible index (1—ratio of vegetative yield in stress and controlled conditions/drought intensity) and growth rate (difference between plant dry weights at T0 and T1 timings). Sorghum responses to moisture stress at all four growth stages have been well characterized. Variation in these responses has been observed and found to be heritable (Reddy et al. 2007). Since the phenotypic responses of genotypes differing in drought tolerance can be masked if drought occurs at more than one stage, screening techniques have been developed to identify drought-tolerant genotypes at each of the growth stages, separately (Reddy 1986; Blum et al. 1989; Muchow et al. 1996; Haussmann et al. 1998; Borrell et al. 2000; Harris et al. 2007). 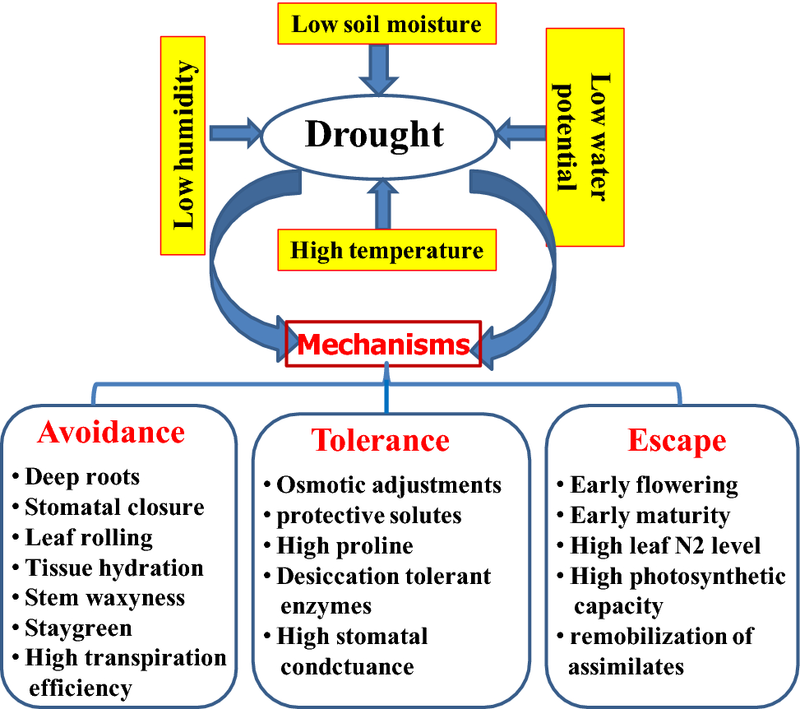 Of the several mechanisms to circumvent drought stress in sorghum, drought escape (related to shorter maturity durations), drought avoidance (maintenance of higher leaf water potential, LWP), and drought tolerance (related to greater osmotic adjustment, OA) are important and have been well characterized (Reddy et al. 2009). However, LWP and OA did not correlate well enough with grain yield in field conditions to merit selection based on them; in addition, screening techniques developed based on LWP and OA were not cost effective in sorghum breeding. Estimation of chlorophyll content (Chl a:b) spectrophotometrically, gas exchange using photosynthesis system (LICOR 6400XT), protein and soluble sugar assays under moisture stress and well watered conditions would elucidate plant response to drought stress. Recently ICRISAT has developed an innovative phenotyping technique—LeasyScan combined with lysimetric capacity, to assess canopy traits affecting water use (leaf area, leaf area index, transpiration) (Vadez et al. 2015). Phenotyping for physiological traits needs to be considered in developing high yielding cultivars with increased heat and drought tolerance (Ghanem et al. 2015). Recent advances in DNA techniques have resulted in rapid sequencing of entire genome of crop plants at reduced cost. However, the way genetic instructions from genes translate into traits is still unclear and phenotypic data will continue to be a powerful predictor of important biological outcomes (Houle et al. 2010). Thus high quality, yet cheap, phenotyping techniques are needed to realize the potential of breeding for drought as a route to rapid screening. The combination of data on yield and secondary traits in multi-site field experiments ranging from well-watered to high stress levels are useful. Secondary traits can be classified according to their relationship to flowering, accessibility to water, efficiency of water-use (WUE) and photo protection. Selected drought tolerant genotypes can be tested for physiological and biochemical indicators associated with drought such as electrolyte leakage, malondialdehyde level, total protein content, antioxidant enzyme activity at seedling, vegetative and flowering stages to understand the mechanism of the heat tolerance characteristics/traits of the selected germplasm and explore the potential of pyramiding different genotypes for drought tolerance. Furthermore, the drought tolerant lines are also being tested in hot spot areas in the field to evaluate their performance under field conditions in drought stressed environments. Moisture stress during pre and post flowering stage would drastically reduce yield, especially in arid and semi arid regions. Several studies have been undertaken to investigate QTLs and their associated effects on drought-related traits. Most of the known QTLs for these traits were identified either in recombinant inbred lines (RIL’s), near isogenic lines (NIL’s), F2 and F3 populations. Under terminal drought, the stay-green trait has a positive impact on grain yield. Several stay-green QTLs are identified and co-localized for grain yield, flowering time, and plant height. Four major staygreen specific QTL’s viz., Stg1 (on SBI-03), Stg2 (SBI 03, Stg3 (SBI 02) and Stg4 (SBI 05) have been correlated to reduced leaf senescence and found stable across different environments (Crasta et al. 1999). The phenotype observed in a plant subjected to moisture stress depends on the genotype. However, even if the plant exhibits certain responsive genes, this does not mean that the DNA is transcribed, translated and performs a function in the plant, which is determinant to observe a tolerant phenotype. This is because transcription of the DNA and a chromatin remodeling is necessary, making DNA accessible to transcriptional factors which will effectively activate the initial response. In a following step, the presence of a transcript does not guarantee the final response, since RNA processing (alternative splicing) and post-transcriptional regulation processes (SiRNAs) are determinant. Subsequently, post-translational modifications occurring in the resulting protein will determine whether or not it will have an active biological function in the cell phosphorylation, glycosylation, ubiquitination, etc. Finally, active proteins will participate in metabolic pathways responsible for the synthesis of essential metabolites for determining a phenotype in terms of drought responsive traits (Fig. 4). Thus, a joint analysis of genome, transcriptome, proteome and metabolome data is required for understanding of the molecular mechanism that triggers the response to drought. The complete genome of sorghum has already been sequenced and is available in the database (NCBI and phytozome). In order to identify the transcripts, proteins and metabolites associated with tolerance to drought stress, it is necessary to analyze these sequences using various bioinformatic tools. Transcriptome analysis on sorghum BTx623 genotype showed 186 genes that were differentially expressed under drought (Ghany et al. 2016). In addition, it has been shown that more than 7000 RNAs undergo alternative splicing. Of the 14,550 expressed genes, more than 11,000 transcripts showed at least one supported poly (A) site. In R16 genotype, transcriptome analyses under drought stress, showed 966 upregulated genes and 224 downregulated genes (Johnson et al. 2014). Among the upregulated genes, P5CS2 was involved in compatible solute proline metabolism and HKT1, an ion transmembrane transporter was involved in the maintenance of Na+ cellular homeostasis. Other upregulated genes comprise stress response genes mainly in response to water deficit, as well as genes associated with ABA response. Analysis of the transcripts on BTx623 genotype subjected to drought stress identified 700 downregulated genes and 1650 upregulated genes (Dugas et al. 2011). Among the differentially expressed genes, those involved in biotic and abiotic stress responses, cell growth and development, sugar and hormone biosynthesis were found significant. In addition, several aquaporin genes (AQP) have been identified (PIP’s, TIP’s, NIP’s, SIP’s) in crop plants, which are associated with plant development and abiotic stress response (Reddy et al. 2015). These genes need to be validated through association analysis, proteomics and reverse genetics tools such as TILLING (Targeting Induced Local Lesions in the Genomes) and Eco-TILLING (Comai and Henikoff 2006). In order to identify differentially expressed genes among sensitive and tolerant sorghum genotypes (IS20351 and IS22330), a transcriptomic analysis was undertaken (Fracasso et al. 2016). The expression of genes related to drought tolerance was greater in the sensitive genotype than in the tolerant genotype. According to gene ontology, most genes up regulated in the sensitive genotype are related to stress responses, abiotic stimulation and oxy-reduction reactions. Secondary metabolism, photosynthesis and carbon fixation, lipids and carbon metabolism were the most affected pathways in the sensitive genotype under drought stress. Some regulators of drought-stress responsive genes were identified in sorghum, as AP2/ERF and bZIP family of transcription factors (Joshi et al. 2016). Advances in molecular biology tools and the development of techniques such as microarray and RNASeq have enabled the analyses of transcriptomes in many species under wide range of environmental conditions. This information has increased the understanding and identification of candidate genes under stress conditions. However, it has been shown that protein translation and post-translational regulation play a vital role in stress adaptation (Ghatak et al. 2017). This requires proteome analyses under drought stress conditions and can provide insights into the changes occurring in proteins, complemented by transcriptomic information. Recently next generation sequencing platforms have become popular for sequencing with low genome coverage for marker development. Some NGS technologies such as reduced representation libraries (Davey et al. 2011), restriction site associated DNA sequencing (RAD-seq) (Baxter et al. 2011; Simon et al. 2011), low coverage genotyping (Huang and Han 2014) have been applied to model crop plants and also in major food crops. The sequence reads can be used to develop SNP or haplotype diversity with different races/germplasm stocks grown under different stress conditions (Pool et al. 2010). The proteome of drought-tolerant sorghum consisted of group of proteins, such as chaperones, which are associated with protein stability, reallocation of metabolites to newly developed structures and efficient synthesis of proteins under stress conditions. However, in the sensitive genotype the most evident proteins were those associated with cell death and proteases (Jedmowski et al. 2014). Drought stress changes the profile of metabolites present in leaves and roots of sorghum. In leaves, changes in sugars, such as d-mannose, d-glucose, isomaltose, fructose and sucrose, in addition to myo-inositol and l-asparagine, were reported (Pavli et al. 2013). In roots, the most influenced compounds were d-glucose, fructose, sucrose, d-(+) trehalose and d-mannitol. These results demonstrated the importance of sugar metabolism in drought stress. Applying omics tools, systems biology associated drought mechanism can be elucidated using information on transcripts, proteins and metabolites produced in response to the stress. This information can outline the mechanisms of response to drought; possibly identifying potential targets for plant breeding. The need for increasing food and energy demands with limited resources under changing climatic conditions has generated new challenges in the farming sector. In order to meet the future food demand, development of climate resilient cultivars and precision agriculture management techniques are required for sustaining the food security in the climate change scenario. The major focus area to achieve this goal is precise quantification of response of plants to different stresses in order to identify superior genotypes and complex network of genes. Traditional breeding methods so far mainly focused on improving the yield, yield components and disease resistance. But with climate change, there is need to breed cultivars for traits related to anatomical, ontogenetical, physiological and biochemical functions in future. Conventional methods of phenotyping are time and labor consuming and often destructive in nature. Quantitative traits are governed by polygenes and interact with environment to express differentially. This dynamic interaction required to be translated into change in the trait values to understand plant phenome. In order to integrate the phenotype with genotype the concept of “Phenomics” has emerged recently from traditional plant physiology coupled with high resolution imaging technologies that capture the physiological processes under different stress conditions. The time series data help to analyze high throughput phenotyping across large plant populations producing differential stress responses of the plants. In the genetic improvement of crop plants, forward phenomics involve phenotyping tools in identifying superior germplasm lines possessing desirable traits. While, in reverse phenomics best genotypes with known desirable traits will be further exploited to identify mechanisms underlying their potentiality to perform better. This involves dissection of potential genotypes for series of physiological, biochemical and biophysical processes using high throughput phenotyping tools in understanding complex bilogical processes. Thus, phenomics provides an opportunity to integrate genetics and physiology to understand the molecular genetics of wide range of plant processes under extreme climatic conditions. Precise phenotyping is pivotal in conventional and genomics assisted breeding programs. Looking to the importance of trait values in time series, advanced high throughput phenotyping tools have provided several root/shoot phenotyping platforms. Such phenotyping platforms would facilitate simultaneous proximal sensing for spectral reflectance, canopy temperature and plant architecture. This would help in recording data on multiple plots, throughout the crop cycle (White et al. 2012). By deploying prototype vehicles with sensors and data loggers, reliable data can be obtained. Most commonly used devices in plant phenotyping are multispectral, hyper spectral, fluorescence and thermal sensors/imagers for ground/aerial platforms using radiation reflected by the crop canopy (Araus and Cairns 2014) (Table 2). Infrared thermal technology would help in automated measurement of canopy temperature for high throughput field phenotyping. It is widely used to assess crop water use efficiency and photosynthetic function under stress conditions (Furbank and Tester 2011). The efficiency of light harvesting in PSII (Fv/Fm) can be estimated using pulse amplitude modulate flourometry (PAM) (Baker 2008). Radar via synthetic aperture radar (SAR) is instrumental in high throughput phenotyping of plants for soil humidity, shoot/root architecture (Pauli et al. 2016). Light detection and ranging (LiDAR) and radio detection are highly preferred for phenotyping. It is based on the visible to near infrared light sensing techniques for deeper penetration to provide canopy height and shoot architecture (Rebetzke et al. 2016). One can monitor green leaf area distribution for separation of staygreen phenotype. NIR-spectroscopy equipped on grain harvester provides seed quality assessment on large area. Some of the future technologies viz., X-ray images of roots in soil, high resolution NMR-based imaging of roots in soil, Terahertz imaging of water content with new softwares for data mining would lead to second generation phenomics. A controlled environment-Conviron greenhouse integrated with Lemna Tec Scanalyzer 3DHT installed at Danforth Plant Science Center (Ohio, USA) provide conveyer and imaging system for quantitative, non-destructive time series phenotyping of small to medium sized plants (Pauli et al. 2016). The system include RGB cameras and NIR reflectance with Pulse Induced Chlorophyll Fluorescence, which can estimate leaf and shoot area, biomass, plant and leaf morphology in time series. The Camelina panel has been undergoing phenotyping for drought stress at two different field locations using these phnotyping tools. Lemnatec, a dynamic non destructive analysis of crop plants, has been installed at National Plant Phenomics Center, UK, providing 880 carriages and gravimetric watering control, imaging (2.5D RGB), thermal and root column imaging, laser scanner and NIR imaging components. The Photon System Instruments (PSI): Plant ScreenTM monitor various aspects of crop growth and development under biotic/abiotic stresses using RGB and chlorophyll fluorescence imaging. The Plant Eye—a high resolution 3D laser scanner helps in assessing plant growth parameters under field/green house conditions. Climate Controlled Facility at ICAR-IARI (Indian Council of Agriculture Research), New Delhi has been equipped with eight different imaging platforms for high resolution phenotyping. Plants can be lifted and turned in desired angles to record side and top images inside the imaging units. Various sensors installed are useful in measuring early vigor, growth rate, biomass, senescence, photosynthetic pigments and photosynthetic efficiency of crop plants. Genomics approaches with recently evolved sequencing platforms have enabled us to study genetic basis of quantitative traits using QTL analysis. As discussed, high throughput phenotyping platforms enable huge multi-trait, multi-environment data under different stress conditions and would be challenging to analyze and interpret to infer any conclusions. Even the multi-trait QTL x environment interactions for marker trait associations are also statistically complex. Added to this, polyploidy and pleiotropy have made the analyses still complex. Therefore, in order to address these concerns, plant models are required to simulate their response and growth as dictated by the physiological processes under stress conditions. Controlled conditions are ideal in elucidating genes governing complex traits under varied conditions (radiations/temperature/water). Using high-throughput phenotyping tools, precise data on morphological and yield contributing data from multi-environment would help us to associate with genomic regions governing the quantitative traits. For meaningful genetic dissection and association studies including linkage based QTL mapping, association mapping (GWAS), marker assisted back cross/recurrent selection and genomic selection (Cobb et al. 2013). Invasive or destructive methods of plant phenotyping used earlier are now replaced by the high-throughput precise and nondestructive imaging techniques. Several phenomics platforms are being installed worldwide enabling breeders and molecular biologists to precisely study inheritance pattern of complex traits. Sorghum is an important cereal crop grown in the arid and semi-arid regions under rainy and post rainy seasons. It is well adapted to the drought prone environments due to various morphological and physiological adaptations. Drought stress has a major impact on plant survival and productivity. Addressing post-flowering drought stress, breeding programs have led to the identification of ‘stay-green’ genotypes, as they can maintain green photosynthetic leaf area until maturity under drought conditions. QTL’s under different drought stress environment have enabled further validation of these genes. Recently, improved methods of phenotyping have revolutionized the pace with which the precise phenotyping can be undertaken on a large population. Thus breeding methods and genomic resources with high throughput phenotyping techniques in an integrated manner would not only improve our understanding of drought resilience but also facilitate the genetic improvement of sorghum cultivars under moisture stress conditions. Authors would like to thank, Joint FAO-IAEA Division Plant breeding and Genetics section for support and encouragement under the IAEA-CRP 23031 “Improving Resilience to Drought in Rice and Sorghum through Mutation Breeding” project.